The first thing one has to do when analyzing a set like this is remove one’s own personal preferences from the equation. If you put a bunch of rabid Springsteen fans in a room, one person’s ‘essential’ set of songs would vary wildly from another’s; I might pick “Racing in the Street” and “Promised Land” to represent Darkness, and you might choose “Candy’s Room” and “Adam Raised a Cain.” Neither person would be ‘correct’ about what constitutes ‘essential,’ because, as Springsteen himself notes in the set’s liner notes: “In any body of work there are obvious high points. The rest depends on who’s doing the listening. Where you were, when it was, who you were when a particular song or album cut the deepest.” And that is, of course, going to vary for every listener. That’s why the goal here isn’t to satisfy the tastes of fans who know every word of every song. That would be impossible, and silly to boot, since those fans probably own the entire discography. 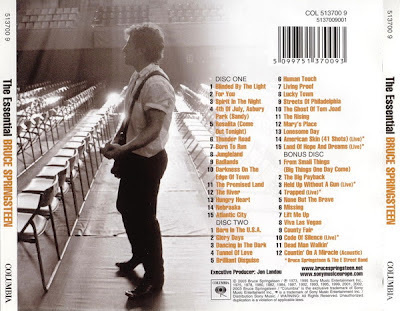 The goal is to give an overview of Springsteen’s career that best represents what the man and his music are all about to a fresh, objective listener, and with that goal in mind, I think the “Essential” set is nearly perfect. It progresses through the discography, from the first album, Greetings From Asbury Park, through to the latest release at the time, The Rising, giving two or three songs from every record, usually in their original track listing. Fans are of course going to have eyebrows raised when they see “Tenth Avenue Freeze-Out” missing from the Born to Run section, “Racing in the Streets” from Darkness, etc. But taking a step back, I see why those and other songs are missing. They may mean something to us, who have long since absorbed them into our musical diet, but that doesn’t mean they’re going to affect newcomers in the same way. I’d argue that many unfamiliar with Springsteen wouldn’t necessarily sit through a long, slow track like “Racing” without a greater context to put it in, and they might not have the immediate love or excitement for “Tenth Avenue” if they don’t understand the legend of the Big Man. The “Essential” set is all about giving new listeners that context so they can discover those songs in the future. That’s why “Jungleland” is here: if you want to understand Bruce’s music, you have to understand the E-Street Band, and if you want to understand the E-Street Band, you’ve got to comprehend the power of Clarence Clemons, and that picture would simply be incomplete without the “Jungleland” solo. That’s what I like about the “Essential” set. Sure, it’s got obvious inclusions like “Born to Run,” “Hungry Heart,” and “Dancing in the Dark,” songs even relative newcomers would expect to hear, but it also takes care to include tracks the uninitiated are unlikely to recognize but are still bound to enjoy. A standard “Greatest Hits” collection wouldn’t include anything from the first two albums, like “Spirit in the Night” and “4th of July (Sandy),” or even Nebraska, which was a radical departure even for die-hard fans. But “Essential” gives us a taste of everything, allowing newcomers to sample the breadth of Springsteen’s entire career and, again, create a context for future listens. Would I change some things if this were my ‘essential’ set? Of course. But I know newcomers wouldn’t ‘get’ songs like “Kitty’s Back,” “The Price You Pay” and “Downbound Train” the way I do. Choices like “Rosalita,” “Badlands” and “Glory Days” are more likely to be appreciated by everybody, while still clearly establishing the genius of Springsteen’s music. So on the whole, I really like the track listing. My only legitimate complaint would be that, given the length of The River, there should probably be more than two songs representing, and considering how “Waiting on a Sunny Day” has become one of the Band’s most beloved concert staples, it’s absence is questionable. There are also a couple of odd sequencing issues, like the jump from “Badlands” to “Darkness,” skipping everything in the middle of that album before jumping back to “Promised Land,” or the way The Rising tracks run in reverse chronological order. But that only bothers me because I’m used to how those songs sound on the record. I think the “Essential” release does exactly what it sets out to do, and I’d feel totally comfortable lending this set to a friend who wanted to know why I write a weekly column about a sixty-year-old rock star. They would certainly come away with an understanding, and if they aren’t intrigued to hear more, I would know that Springsteen just isn’t their style (crazy, I know, but it sadly happens). There is, of course, an argument to be made for using one of the actual albums to get newcomers interested in the Boss. Springsteen’s music has never, at least at its best, been about individual songs, but the larger experiences those songs create, and that’s something you simply can’t get on the ‘Essential.’ Bruce’s mastery of the album format is nearly unparalleled, and I do have reservations about someone’s first time hearing, say, “Darkness on the Edge of Town” be out of context. So much of that song’s power comes from the 45-minutes of preceding musical material, and you don’t get that on the ‘Essential.’ But if you go down the album route, you reach the equally tricky quandary of choosing which album to represent Bruce’s body of work. Is it Born to Run? Darkness? Born in the USA? All have valid claim to that stake, and all would be good choices, but for a newcomer, none represent what Bruce Springsteen is about as a whole. The advantage of the “Essential” release is that it gives a fairly comprehensive overview, and hopefully gets new listeners intrigued in all the albums enough to seek them out individually. So in the end, I would say yes – “The Essential Bruce Springsteen” is a good starting place for newcomers. The thing that really impresses me about the set is that despite its target audience, Bruce and his team went the extra mile to make it worthwhile even for fans who own the majority of these songs. Taking the bonus disc out of the equation, “Essential” is worth owning for the nice packaging, the lyric booklet filled with cool pictures, and most importantly, the remastering work done on all the songs. They haven’t been given a comprehensive restoration like the recent Born to Run and Darkness reissues, but the songs all sound better than their original CD counterparts, and makes me long for new remasters of the entire catalogue. I wish the entire E-Street Shuffle album sounded as good as “Sandy” and “Rosalita” do here, or the entire River CD was up to snuff with these track picks. “The Essential Bruce Springsteen” came out in 2003, and it makes me a little sad that in that entire time, only two of the albums have gotten new masters. Oh well. 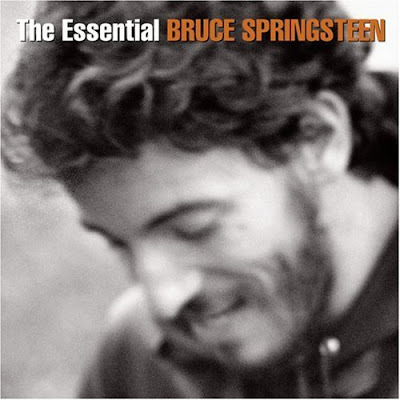 “The Essential” is a decent placeholder until that happens, and more importantly, it remains the best, most intelligent collection of Springsteen’s work available for new listeners. Perhaps it will one day be updated with picks from Devils and Dust, Magic, or Wrecking Ball, but until then, this is the place to start if you’re not sure how to tackle the legend that is Bruce Springsteen. Springsteen Sundays is an exclusive column celebrating all things E-Street. It appears here each and every Sunday, and we hope to see you again next week. Thanks Luca! Wouldn't it be crazy if they slapped "Queen of the Supermarket" on the next compilation, though, just to irritate the fanbase? That would make me laugh.